Ernie McLean was born April 25, 1936, in Chatham, New Brunswick. He was raised by a great uncle, in Barnaby, about 25 miles away from Chatham where he achieved grade eight. Education was not available beyond this for many at this time, including Ernie, so he went to work, eventually moving to Ontario in his late teens seeking to better himself. He worked hard in factories and gas stations, and after marrying his wife Winona in 1954, finally achieving his mechanic’s license in 1957. Ernie McLean has been involved in racing since 1957 when he began attending races at Pinecrest Raceway. There he met Jim Hallihan, (a legendary racer and an integral part of Scotia Speedworld today) who sold him a car. 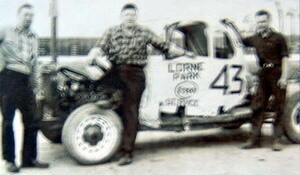 Ernie raced at all the tracks in the Ontario region including Flamboro, Sutton, Nilestown and the CNE. ” The CNE was the last track I raced on, with a car I built myself.”Ernie smiled, obviously thinking back to those early days. A desire to return home to New Brunswick led him to become employed with Drury’s Transport and buy an old farmhouse near Riverglade on the site of the present Riverglade Speedway. There was no stock car racing at that time so Ernie went about drumming up interest with meetings, posters and talk. He also started to build a quarter mile track out “behind the barn”. Eventually, Ernie was spending so much time working on the track that he had to give up his “day job”. Finally, on August 22, 1964, the first race at the new facility was run and it was an “immediate hit”. The track was dirt at this time and posts and cables served as fencing. Ernie with his first race car. In 1965, Ernie took on a partner, Jerry Campbell, and the two remained partners until around 1975. 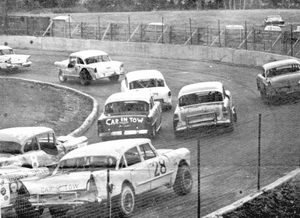 They immediately went about paving the track,(making it the first paved track in the Maritimes), installed lights, built grandstands, built canteens, built a tower, washrooms, ticket booths and put a guardrail around the track. “All the stuff we didn’t have the first year” Ernie laughed. 1965 was a big year for the McLean family. Not only was the track doing well, but Ernie staged the first “extra distance” event in the Maritimes as well. It was the inaugural Riverglade “International” and 2007 will mark the 43rd consecutive edition of this race. The winner of that first race was John Shirtliff from Ontario and the winners list since then reads like a “Who’s Who” of racing. In 1966, Ernie’s old friend Jim Hallahan and eight other drivers from the Toronto area showed up to race the event, along with drivers from all around the Maritimes with Jim Hallahan claiming the victory. Other International winners included Earl Ross, Don Biederman, Frank Fraser and Junior Hanley. In 1967, Ernie was approached by Bill Digdon, who had just finished building a track in Havre Boucher, near the Canso Causeway. Ernie agreed and they paved the track, got cars built and started racing. There were no lights so racing was held on Sunday afternoon. This actually worked out well for McLean as he would run the show at River Glade on Saturday night, drive to Havre Boucher overnight, race Sunday afternoon, then drive back home to get the programs ready for print on Monday morning. “There was no Trans Canada back then. We had to drive the old Sunrise Trail” Ernie smiled. In an interview with Ken MacIsaac a few years ago, Ernie related a story about Rollie MacDonald (now a Canadian Racing Hall of Fame member). By the end of the sixties, there were several tracks operating in the Maritimes and Ernie was bringing big shows into Riverglade. The “Super Modifieds” from New England came in 1967 and returned for many years afterward. Competition is usually a good thing but too many tracks started to water down the car counts but Ernie just kept on promoting racing and eventually many of the “new” tracks got in trouble and began to close down. Ernie reached out to those he could and over the years managed Riverside Speedway, Miramichi Speedway, Brookside Speedway and Danny’s Speedbowl at one time or another. Riverside Speedway still exists today because of Ernie McLean as he brought several of his top-flight shows to the “high” banks. Ernie was instrumental in setting up the MASCAR tour which dominated Maritime stock car racing from 1983 until the Maritime Pro Stock Tour took over in 2000. 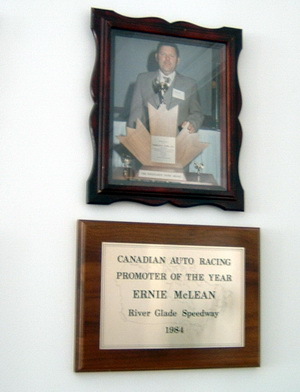 At this time McLean had several big races on the River Glade schedule and he made the Canada Day 100, the Eastern 75 and the “International” part of the MASCAR schedule. After they had celebrated their 30th anniversary at the track in 1994, Ernie announced it was time to move on and that he had sold the track to Pat Rodgers. They purchased the Atlantic Motel and had planned to retire to their new home near Elgin, NB. Stock car racing in New Brunswick was literally invented, nurtured and propped up by this dynamo of a promoter. Originally from Chatham, N.B. Ernie got into racing in Ontario when he started hanging around the Pinecrest Speedway in Toronto. He bought his first jalopy-type stock car from Jim Hallahan. Like many people behind the scenes, Ernie realized his talents lay in other areas. Taking his wife and family back to the Maritimes, he settled in River Glade N.B. There was no racing in New Brunswick at the time; so Ernie put up posters and held a meeting to gauge interest in Moncton and other locales. As a result, he plowed out a quarter-mile track behind his barn on his River Glade property and River Glade Speedway was born in 1964. In 1965 he paved the place and thus was born the first asphalt oval speedway in the Maritimes. His extra-distance “International” was born in 1965 and many a Canadian and U.S. driver has claimed this race as their first “big win,” among them Earl Ross, Junior Hanley, and Don Biederman. As other tracks opened, Ernie responded to the competition by bringing in the NESMRA super modifieds and other attractions. As other tracks fell into disrepair or neglect, Ernie stepped in to rescue them – among them Miramichi Speedway, Fredericton’s Brookside Speedway, Bathurst’s Danny Speedway and Riverside Speedway near New Glasgow, N.S. Due to the unwavering work of Ernie, those tracks continue to flourish today. Ernie was instrumental in forming the MASCAR touring series. He also brought the NASCAR North and American-Canadian Tout to Maritime ovals. Not one to sequester himself in the racing fold, Ernie also sponsored courEt1ese local hockey teams from kids to old-timers. He was twice honoured by Toronto’s Promoters Workshop, once with the Achievement Award for Dedication to Racing Promotion and a second time as Promoter of The Year. In short, Ernie introduced a sport to an area of the country where none existed, he initiated hundreds of drivers to this sport, he gave thousands of fans the opportunity to enjoy the sport. 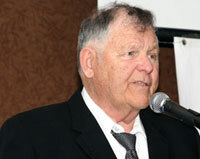 His nickname, “Father of Maritime Canadian Stock Car Racing”, is richly deserved. Now that the McLeans have retired, they have more time to focus on their latest contribution to the world of racing: the Maritime Motorsports Hall of Fame. Both Ernie & Winona are acknowledged as integral in seeing an idea turned into reality. 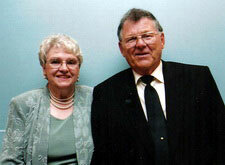 Both continue to serve on the Board and are involved in day-to-day operations. They are the Father – & Mother – of Maritime Motorsports.